This article was written to outline the steps required to resize the disk space on a Codero Cloud instance that had previously been upgraded to a larger size. A running Codero Cloud instance that had previously been upgraded to a larger size. By admin on July 18, 2014 | Cloud, Linux | A comment? This article describes the steps required to restore a previously created Codero Cloud snapshot. Please note that Codero Cloud servers can only be scaled UP and cannot be scaled down. In order to scale an instance down, you will need to first create the smaller instance, then copy your data to the new instance manually. 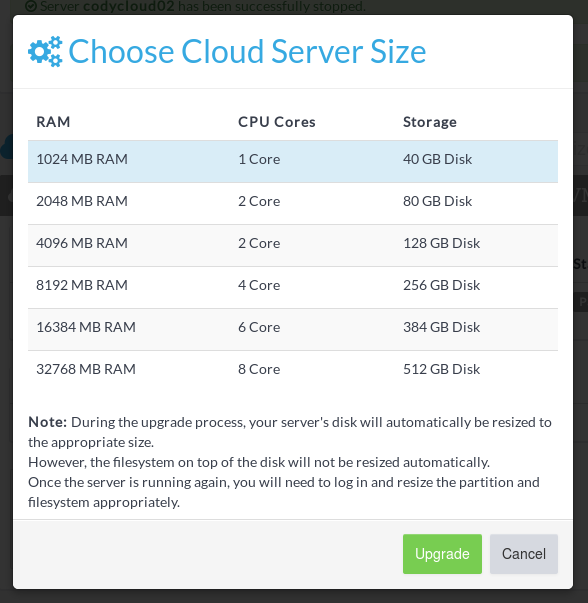 Lists all available cloud servers by clicking the small cloud icon from the Main Menu. If you do not see the Cloud control options (Start, Restart, ect., click the the downward pointing arrow located at the right of the cloud description. The server must be stopped before you are able to upgrade it. To stop the instance, click the “Stop Server” icon. After the instance has stopped, click the “Upgrade Server” icon. This will display the sizes available. A new window will appear with the available upgrade options. Click the size you wish to upgrade to, then click Upgrade. After a few moments, your server upgrade will complete and will automatically restart. You will see the upgrade change in the cloud description. While your instance is ready to accept the new drive size, you will need to manually resize it. The steps to resize your drive are quite different between Linux and Windows systems, so these steps are outlined in different articles. By admin on July 12, 2014 | Cloud | A comment? Click the “Restore Snapshot” icon. This will display the “Restore from a snapshot” confirmation form. The screen will update displaying different stages of the restore process. The server will restart before the process has completed. By admin on | Uncategorized | A comment? 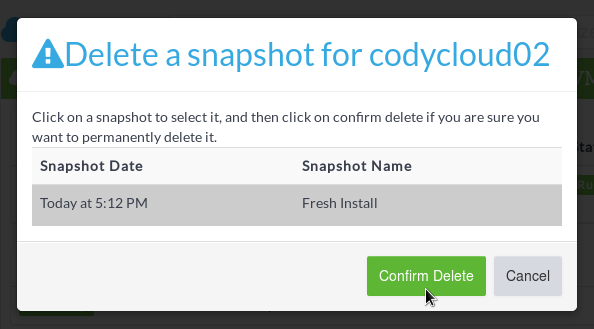 This article describes the steps required to delete a previously created Codero Cloud snapshot. Codero cloud instances are only allowed 1 snapshot each. In order to create a new snapshot, you will need to delete any existing snapshots first. Click the “Delete Snapshot” icon. This will display the “Delete a snapshot” confirmation form. After deleting a snapshot, it is strongly recommended to immediately create a new one. Failure to do so may result in an irretrievable loss of data. By admin on July 11, 2014 | Cloud | A comment? 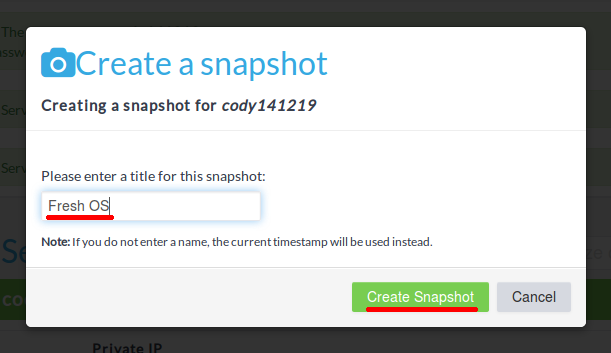 This article describes the steps required to create a snapshot of a Codero Cloud instance. 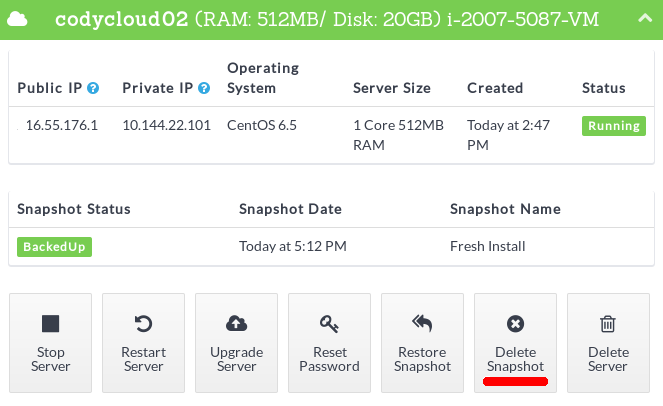 Snapshots are used to restore a cloud instance back to the exact state the instance was in at the time the snapshot was created. This means a snapshot can be used as a rudimentary form of backup. When a snapshot is applied, all files on the instance are in restored. 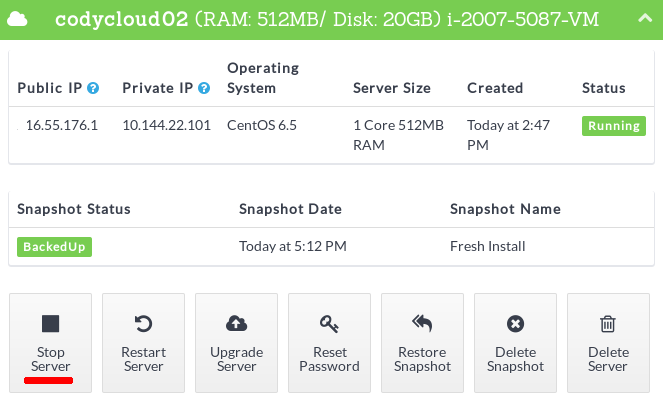 Cloud instances are only allowed 1 snapshot each. If you have previously created a snapshot, you will need to delete the existing snapshot before you can create a new one. A previously created cloud instance. Click the “Create Snapshot” icon. This will display the “Create a snapshot” form. 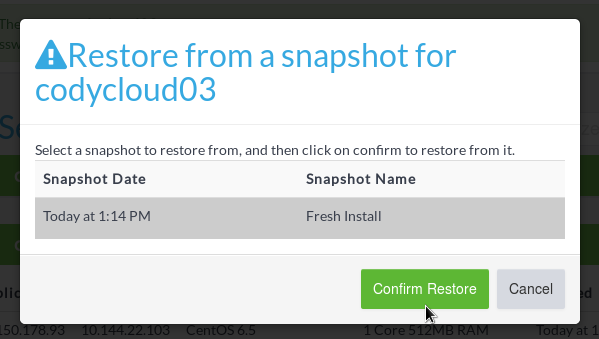 Once the snapshot has completed, you will see the “Restore Snapshot” icon in the Cloud Control Options. By admin on | Cloud | A comment? * A current Codero Cloud Account. 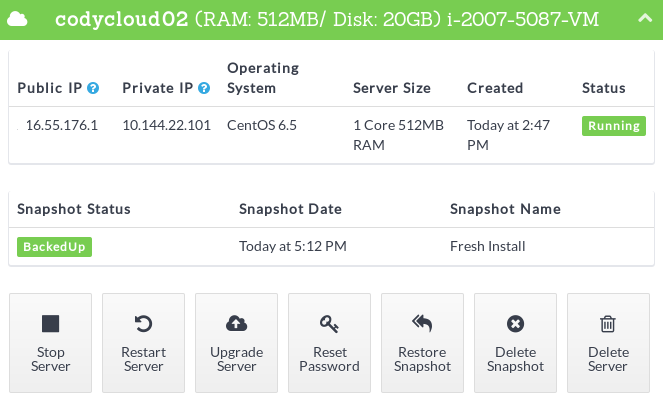 To begin creating a new cloud instances, click the symbol from the Main Menu in the left column. This will open the Create Cloud Server screen. Select a unique name identifier for this server. The name may only contain characters A-Z, 0-9 and hyphens (-). You are limited to a total of 60 characters for the name and it cannot start with a hyphen. Codero Cloud instances are available in a variety of sizes. Each size has predetermined RAM, Bandwidth, cores and disk space. Click the option that supports your requirements. The monthly pricing for each size option is displayed on the right. If you intend to create a Windows instance, you will need to select a server with 1024 MB RAM minimum. Lower options will not support the Windows operating system. Select the desired Operating System (OS) by clicking on the OS Icon, then select the required version. Any additional license fees for the selected OS will be displayed on the right. If you require MSSQL, but do not need the advanced options provided with MSSQL Standard, you should create an instance without MSSQL, then install your own version of MSSQL with the license provided to you by Microsoft. There are no options to select since Codero Cloud Bandwidth pricing does not change based on the cloud’s configurations. Currently, all incoming bandwidth is free and so is any private communication between the instance and any other Codero servers on the account provided they are connected with a Hybrid connection. Select your desired billing period. Select between Hourly or Monthly. Hourly instances are best for development or for offloading processing spikes. If you are using your instance for hosting or other continuous services, select the Monthly option for the best pricing. Note that when you change between Hourly and Monthly billing cycles, the prices listed for each Size and OS license fees are updated automatically. Hourly instances are billed from the creation time until they are deleted. Simply stopping an hourly instance does not stop the billing for the instance. To stop all billing on a cloud instance, it must be deleted. The last step is to create your server! Click the blue Create Server button at the bottom of the page. Depending on the size and operating system selected, it may take between a few minutes to as much as 1/2 hour for your instance to be created. Note your Password and IP address! By admin on July 10, 2014 | Cloud, ServerPortal | A comment? 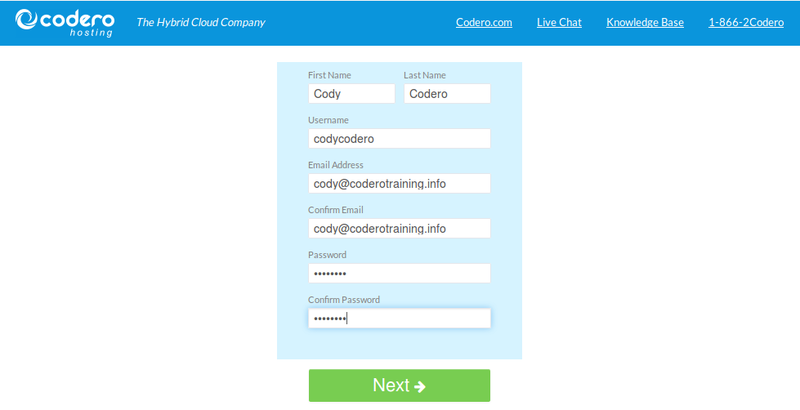 This article is designed to help you navigate your Codero Cloud Portal account. When the screen width is limited, Only icons are displayed and the text descriptions are hidden. This document provides a brief summary of what each icon is used for. A current Codero Cloud account. 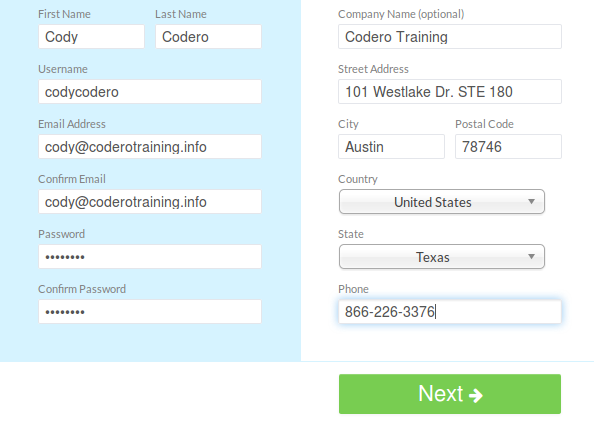 The Codero Cloud Portal main menu (located on the left side of the screen) is broken down in to 4 main sections. Cloud, Billing, API and Support. Each section is defined by a large white icon with their related menu options located below in smaller, light gray colored icons. Use this option to create a new or additional cloud instances. Click here to display a list of all current cloud instances. You will use this option to start, stop, restart, change passwords and more for each instance. Use this option to add or edit your current methods of payment. Use this option to view your billing history. This will display payments made along with credits earned. The Codero API is comprised of a set of http requests that will allow you to create, destroy, start, stop, reboot and other options you might be required to perform on your could instances directly from your software and completely without human interaction. An API Key is required in order to use the API calls. This key authorizes your software to have control access to your Cloud Instances. Click this icon to learn more about the Codero Cloud API calls. Use this option to submit a ticket to the Codero Customer Support Dept. 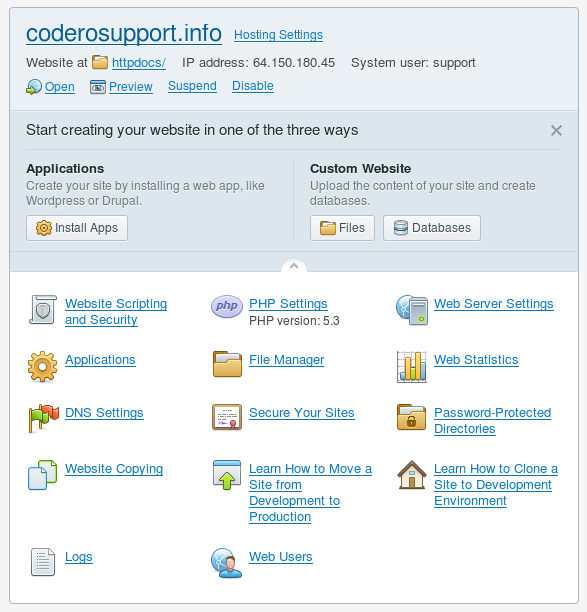 This options will redirect you to your Codero ServerPortal.com management system. Use the 24/7/365 Codero Support online chat system to get quick answers to basic questions or fast resolution to common issues. For more complicated issues, it is recommended to use the ticket system outlined above. 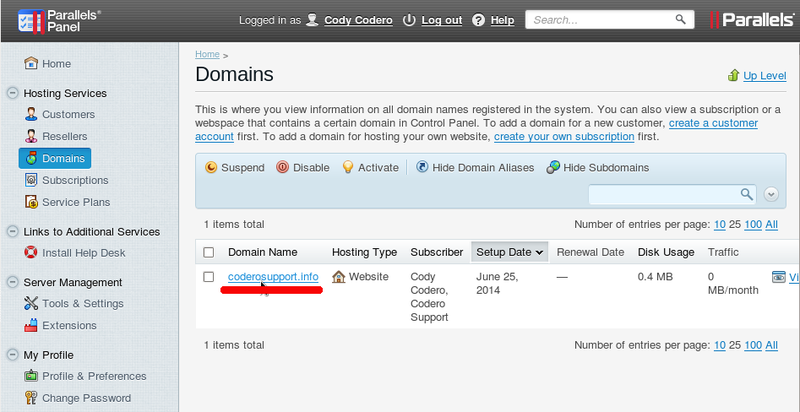 Use the Codero Knowledge Base as your first line of support. Answers to most of your hosting and configuration issues can be found there. We recommend bookmarking useful pages so you can return again and again. By admin on July 9, 2014 | ServerPortal | A comment? This article is intended to assist potential new Codero clients with the steps required to create a cloud account. A cloud account is required to create a cloud instance and only costs $1.00 to get started. A valid credit card: $1.00 will be charged to your card for account verification. Username: Enter a username. This username must be unique. Make sure it is difficult and at leat 8 characters long using a combination of Upper and Lower case characters, numbers and symbols. Confirm Password: Re-type your password. Company Name: Enter the name of your business. This field is optional. Postal Code: Enter the postal code (zip code). Failure to enter a valid phone number may result in cancelation of your order. Credit Card #: Enter the full credit card number, excluding any spaces. CVV2/CID: Enter the 3 or 4 digit security code found on the back of the card. [X] Agree to Terms of Service: Read the Terms of Service (TOS) and check the agreement box. It is important that you read and understand the Terms Of Service for your cloud instance. You will be held legally accountable for all activity originating from your server. Congratulations! You have now successfully created a Codero Cloud account. Locate your name in the upper right corner of the Cloud Portal screen. In parenthesis, you will see a 5 digit number. This number is your new Client ID (CID). Please make a note of this number since you will be asked for it when requesting assistance from Codero support or sales. By admin on | ServerPortal | A comment? This article is designed to provide a few basic instructions for using the Linux nano command line editor. While nano does not offer the power of editors such as vi or vim, it works great for day to day editing where advanced features are not required. Using the nano editor is similar to most graphical editors you have used. Use the arrow keys to navigate the file, and type text as required. You can even use the Delete and Backspace buttons. The keyboard is always in “insert” mode. You cannot de-select this to change to “over-strike” mode. Cancel: If you accidentally enter a command, you can cancel it anytime by pressing Ctrl+c to return to the editor. If you have not saved your work, you will be promted to before exiting the program. Press y to save or n to exit without saving. Type the text to search for and press Enter. Next type the text you are going to replace it with, then press Enter. Press y to replace the displayed instance and move to the next. Press n to skip and move to the next instance. Press a to replace all instances found in the file. By admin on July 5, 2014 | Linux | A comment? This article applies to Plesk users that used the same server to create a CSR (Certficate Signing Request) and have purchased an SSL Certificate from a Trusted Provider. You should have a series of text files from your certificate provider. Open the Advanced Options for the domain you’re going to add SSL to. Website Scripting and Security, PHP Settings, Web Server Settings, Applications, File Manager, Web Statistics, DNS Settings, Secure Your Sites (SSL), Password protecting directories, Website copying, Viewing Logs and creating web users along with information about how to move a site from development to productions and how to close a site from production to a development environment. From the Home screen, click “Domains” then click the link for the Domain name. 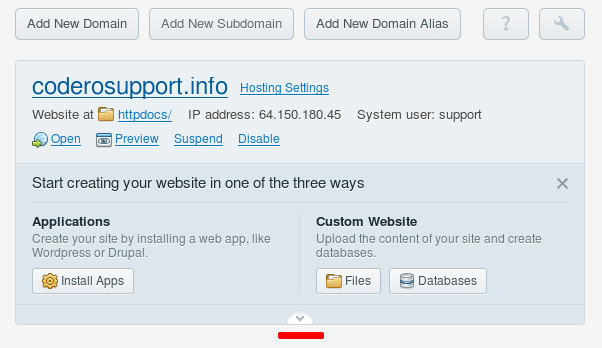 At the bottom of the containing box, click the small arrow at the bottom center to display the advanced domain options. By admin on July 3, 2014 | Plesk | A comment?